Spectators watch as ponies approach the Island of Chincoteague, Va., during the annual Pony Swim. An Eastern Shore tradition celebrated by Marguerite Henry's book "Misty of Chincoteague" is marking its 91st year. 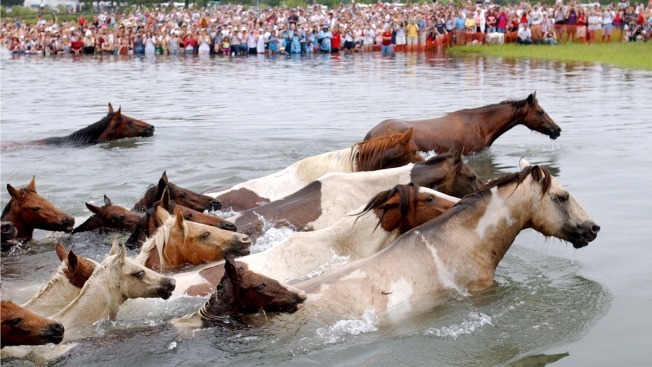 The annual swim of more than 300 wild ponies from Assateague Island to Chincoteague Island, Virginia, will be held Wednesday. A group of volunteers called the "Saltwater Cowboys" rounded the wild ponies up this week. On Wednesday, the group will lead the ponies to Chincoteague Island during slack tide, a 30-minute period between tides when there is no current. The time of slack tide varies, but the event's website says the swim will take place between 9 a.m. and 11 a.m.
An auction of a portion of the herd benefits the Chincoteague Volunteer Fire Department.